According to the Greek mythology, the Korybantes (/ˌkɒrɪˈbæntiːz/; Greek: Κορύβαντες) were the armed and crested dancers who worshipped the Phrygian goddess Cybele with drumming and dancing. They are also called the Kurbantes in Phrygia. The conventional English equivalent is "Corybants". The name Korybantes is of uncertain etymology. Edzard Johan Furnée and R. S. P. Beekes have suggested a Pre-Greek origin. Others refer the name to *κορυβή (korybé), the Macedonian version of κορυφή (koryphé) "crown, top, mountain peak", explaining their association with mountains, particularly Olympus. The Korybantes were the offspring of Apollo and Muse Thalia or Rhytia (Rhetia). In some accounts, they were described as the children of Athena and Helios; further, some call the Corybantes sons of Cronus, but others say that they were sons of Zeus and Muse Calliope. Many assert that the gods worshipped in Samothrace as well as the Kurbantes and the Korybantes and in like manner the Kouretes and the Idaean Daktyls are the same as the Kabeiroi, but as to the Kabeiroi they are unable to tell who they are. A decorous Corybantian dance, as pictured in William Smith's A Dictionary of Greek and Roman Antiquities  (1870). These armored male dancers kept time to a drum and the rhythmic stamping of their feet. Dance, according to Greek thought, was one of the civilizing activities, like wine-making or music. The dance in armor (the "Pyrrhic dance" or pyrrhichios [Πυρρίχη]) was a male coming-of-age initiation ritual linked to a warrior victory celebration. Both Jane Ellen Harrison and the French classicist Henri Jeanmaire have shown that both the Kouretes (Κουρῆτες) and Cretan Zeus, who was called "the greatest kouros (κοῦρος)", were intimately connected with the transition of boys into manhood in Cretan cities. 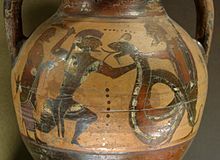 The English "Pyrrhic Dance" is a corruption of the original Pyrríkhē or the Pyrríkhios Khorós "Pyrrhichian Dance". It has no relationship with the king Pyrrhus of Epirus, who invaded Italy in the 3rd century BC, and who gave his name to the Pyrrhic victory, which was achieved at such cost that it was tantamount to a defeat. This myth is Greek interpretation of mystifying Minoan ritual in an attempt to reconcile their Father Zeus with the Divine Child of Crete; the ritual itself we may never recover with clarity, but it is not impossible that a connection exists between the Kouretes' weapons at the cave and the dedicated weapons at Arkalochori". Among the offerings recovered from the cave, the most spectacular are decorated bronze shields with patterns that draw upon north Syrian originals and a bronze gong on which a god and his attendants are shown in a distinctly Near Eastern style. Korybantes also presided over the infancy of Dionysus, another god who was born as a babe, and of Zagreus, a Cretan child of Zeus, or child-doublet of Zeus. The wild ecstasy of their cult can be compared to the female Maenads who followed Dionysus. Ovid, in Metamorphoses, says the Kouretes were born from rainwater (Uranus fertilizing Gaia). This suggests a connexion with the Pelasgian Hyades. The Kouretes dancing around the infant Zeus, as pictured in Themis by Jane Ellen Harrison (1912, p. 23; see References section below). The scholar Jane Ellen Harrison writes that besides being guardians, nurturers, and initiators of the infant Zeus, the Kouretes were primitive magicians and seers. She also writes that they were metal workers and that metallurgy was considered an almost magical art. There were several "tribes" of Korybantes, including the Cabeiri, the Korybantes Euboioi, the Korybantes Samothrakioi. Hoplodamos and his Gigantes were counted among Korybantes, and Titan Anytos was considered a Kourete. Homer referred to select young men as kouretes, when Agamemnon instructs Odysseus to pick out kouretes, the bravest among the Achaeans to bear gifts to Achilles. The Greeks preserved a tradition down to Strabo's day, that the Kuretes of Aetolia and Acarnania in mainland Greece had been imported from Crete. ^ Edzard Johan Furnée, Die wichtigsten konsonantischen Erscheinungen des Vorgriechischen mit einem Appendix über den Vokalismus, 1972, p. 359. ^ R. S. P. Beekes, Etymological Dictionary of Greek, Brill, 2009, p. 755. ^ a b Strabo, Geographica 10.3.19. ^ Quoted by Jane Ellen Harrison, "The Kouretes and Zeus Kouros: A Study in Pre-Historic Sociology", The Annual of the British School at Athens 15 (1908/1909:308-338) p. 309; Harrison observes that Strabo's not very illuminating statement serves to show "that in Strabo's time even a learned man was in complete doubt as to the exact nature of the Kouretes" and second, "that in current opinion, Satyrs, Kouretes, Idaean Daktyls, Korybantes and Kabeiroi appeared as figures roughly analogous". ^ Smith, Dictionary, s.v. "Saltatio". ^ Harrison 1908/09; Jeanmaire,Couroi et Courètes: essai sur l'éducation spartiate et sur les rites d'adolescence dans l'antiquité hellénique, Lille, 1939). ^ At Palaikastro the inscribed "hymn of the Kouretes" dates to ca. 300 BCE. ^ Vermeule, "A Gold Minoan Double Axe" Bulletin of the Museum of Fine Arts 57 No. 307 (1959:4-16) p. 6. ^ G.L. Hoffman, Imports and Immigrants: Near Eastern Contacts with Early Iron Age Crete, 1997, noted by Robin Lane Fox, Travelling Heroes in the Epic Age of Homer, 2008:157; "A bronze tympanum, several cymbals, and sixty-odd shields, many finely decorated, evoke the dance of the Curetes, which is also depicted on the tympanum, even if the bearded god and his attendants are rendered in Oriental style", observes Noel Robertson, "The ancient Mother of the Gods. A missing chapter in the history of Greek religion", in Eugene Lane, ed. Cybele, Attis and Related Cults: Essays in Memory of M.J. Vermaseren 1996:248 and noted sources. ^ Harrison, Chapter I: The Hymn of the Kouretes, p. 1 and 26. On page 26, specifically, she writes: "The Kouretes are also, as all primitive magicians are, seers (μαντεις). When Minos in Crete lost his son Glaukos he sent for the Kouretes to discover where the child was hidden. Closely akin to this magical aspect is the fact that they are metal-workers. Among primitive people metallurgy is an uncanny craft and the smith is half medicine man." ^ Strabo, x.462, quoted in Harrison 1908/09.309 note 4. Wikisource has the text of the 1911 Encyclopædia Britannica article Corybantes.